It's time for another end of the year list! This week, Barbara Walters announced her 10 Most Fascinating People of 2009. Her list included director, actor and producer Tyler Perry, pop icon Lady Gaga and performer Adam Lambert. Her MOST fascinating person of 2009? 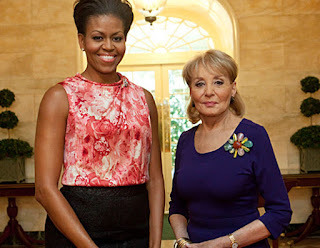 Why, the FLOTUS of course - Michelle Obama. Every year since 1993, with the exception of 2000 and 2001, Barbara Walters' selects her 10 Most Fascinating People of the year. She usually leaks the bottom 9 and holds the announcement of the top spot until her televised program. So, who are some of the people who have held this top spot of Most Fascinating Person? Interesting question: What happened to 2000 & 2001? There weren't too many fascinating folks, I guess. For the entire list of the 10 Most Fascinating People of 2009, check out the ABC website for a slideshow.